I’ve heard of a coat room at a banquet. 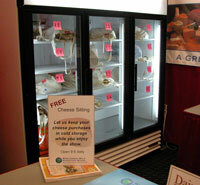 How about a cheese storage room at a farm show? I’ve been putting off buying some cheese here in the America’s Dairyland Marketplace because I can’t leave until Sunday. I didn’t know that the Wisconsin Milk Marketing Board is offering to store your purchases in a refrigerator until you’re ready to leave. How handy is that? Great idea.